He noted the lack of women instrumentalists wasn’t unique to jazz; rock and popular music had the same gender disparity. The situation hasn’t improved in other genres, but I’m happy to report that the younger trad bands are rapidly integrating across the gender line. A wave of female performers have become star instrumentalists, enough of them to create an all-New Orleans supergroup of women who remain vital to their own musical projects. Chloe Feoranzo has led and played with great trad groups all over the country in the last few years. She took her clarinet on tour with Pokey Lafarge and Postmodern Jukebox before finally landing in New Orleans. Haruka Kikuchi, originally from Japan, wowed the West Coast festivals before bringing her Kid Ory inspired trombone playing to the Crescent City—and it doesn’t seem like they’ll let her leave. Molly Reeves has been a mainstay of the Frenchman Street music scene, in demand for her guitar playing as much as her vocals. Marla Dixon leads the stellar Shotgun Jazz Band with her trumpet playing. Julie Schexnayder is a veteran of the venerable New Orleans street musicians cohort the Loose Marbles, first as a dancer and then on stand up bass. Defne “Dizzy” Incirlioglu is a stunningly interpretive washboard player who was a member of the Yes, Ma’am band and can be seen with other groups fortunate enough to have her making rhythm. Though several of these women are fine singers the reason they are in demand is their instrumental skill, and now we can hear them all at once. 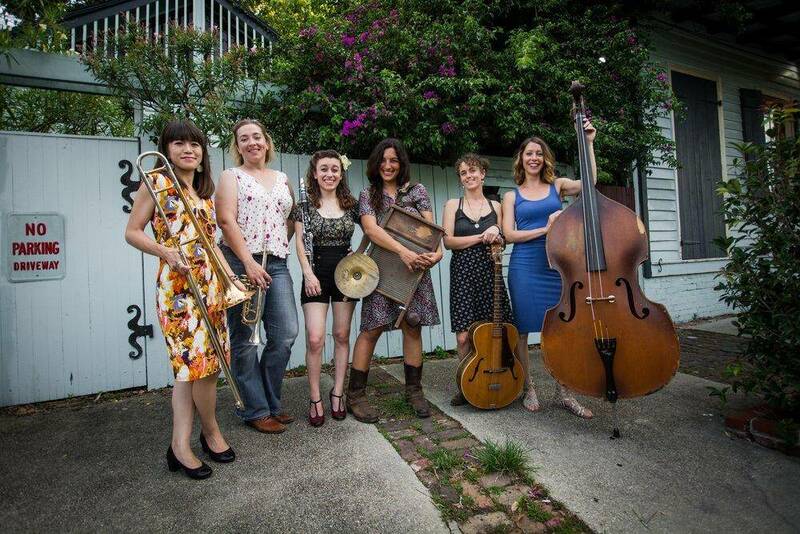 Originally organized by Shaye Cohn of Tuba Skinny for a one-time event, the concept of an all-New Orleans, all-female super group was so compelling to organizers that requests from festivals started pouring in. They’ve already been invited to tour Europe. Their first album, le Donne Mangiano Zucchero, (Italian for, roughly, “The woman eats sugar”) was released in June 2017. Having discovered this group from a YouTube video of a brilliant performance at the Abita Springs Opry, I must admit that when I first heard the album I was disappointed. It felt too constrained by the studio. These are musicians with extensive street and stage experience and though the playing was individually fantastic I felt it lacked some of the camaraderie of the live show, where the mutual admiration between them shines through. On repeated listening, I realized I had been far too harsh. The album is crisp, well thought out, and well produced by Molly Reeves, the guitarist. They are taking the time to get it right in the studio and people frustrated by shaky video and off balance sound on YouTube will be grateful for their efforts. It opens hot with “Washboard Wiggles” giving Dizzy a chance to shine. “Shame and Scandal in the Family” is a clever calypso-inspired number and the female vocal on “Make Me a Pallet on Your Floor” satisfies. They play the song with the slow sultry swing of a New Orleans summer, with inspired solos and some fresh lyrics that give it a contemporary flavor. I have no reservations about their second album, released this March. The band has cohered immensely in a year. This is top notch studio work from the first roaring note. A Woman’s Place pays tribute to female composers between 1910-1930 with 12 great selections you may not have known were written or arranged by women. It’s a much more creative album for having a theme and diverts them from the entertainingly hot playing ubiquitous in New Orleans. The album is named for Vivien Garry’s composition “A Woman’s Place is in the Groove.” Garry had an all-female group in the ’40s and there have been others before and since, but we have something truly special in The Shake ’Em Up Jazz Band and it’s a great sign for the future of traditional jazz. This Review Originally Appeared in the May 2018 Off the Beaten Tracks column. Previous The Glenn Crytzer Orchestra: Ain’t It Grand?